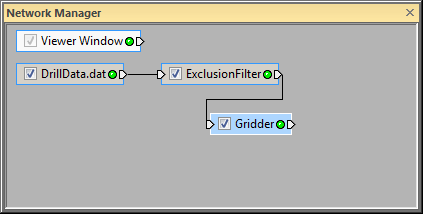 An ExclusionFilter module excludes data points from a point data set based on a user-specified Boolean statement. The Boolean functions can include logical operators (AND, OR, XOR, NOT), comparison operators (=, <>, <, >, <=, >=), and IF conditions (format: true value, false value or condition? true value, false value). Any data the meets the condition will be excluded from any downstream modules like a Gridder module or a ScatterPlot module. In the Network Manager, right-click on the source data and choose Computational | ExclusionFilter. Select the ExclusionFilter in the Network Manager. In the Property Manager, enter the Boolean function next to Filter string to determine which data to exclude. How can I use an Exclusion Filter in a Voxler script?